Since moving to Vancouver Island, British Columbia I have taken my share of ferry rides. 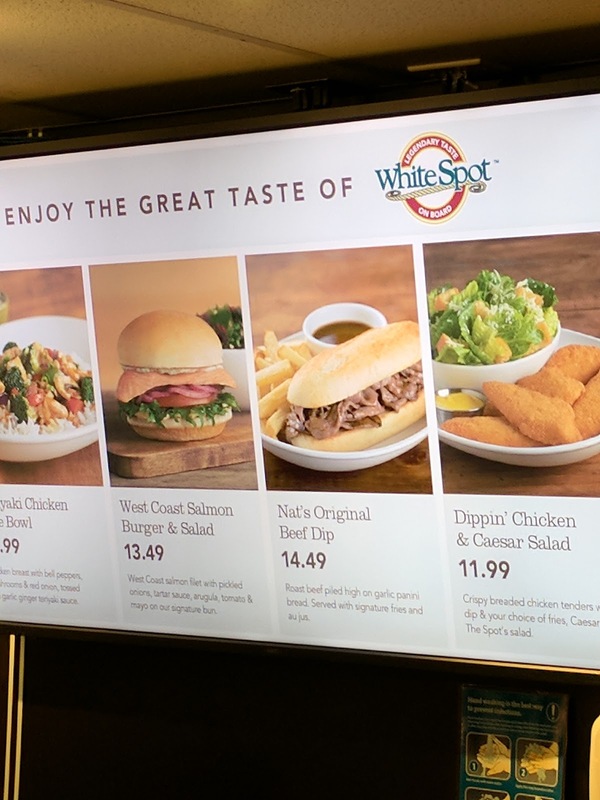 BC ferries has a contract with the White Spot restaurant chain to serve food on the ships. White Spot could be compared to a Denny’s or perhaps a Sheri’s Cafe. It is a bit more of a novelty on a giant steel vessel, but still a low to mid range diner style eatery. Despite my trepidation I decided that on this fateful evening sailing I would order a Nat’s Original Beef Dip from the limited menu. Did it turn out to be a mistake? Do I regret my decision? Was it the best sandwich I have ever had? The answer to these questions, and undoubtedly infinitely more, will be held in the rest of this review. If you stop reading now it will like never watching or knowing what happened at the end of TV series “Lost”...okay perhaps that is a bad analogy. First let me set the scene. Imagine consuming a meal with some of your closest friends in an intimate setting while enjoying a nice Malbec or craft beer. Now imagine brilliant conversation complimented by smooth jazz playing at a perfect level, allowing for both the comforting tones of Miles Davis and pleasant conversation with surrounding confidants. Now imagine the opposite of that. Welcome to eating in the cafeteria of a ship in the BC Ferry fleet. That may be a tad dramatic, but it certainly doesn’t have the atmosphere of a quaint cafe or even a crowded brewpub. It is more like a prison mess hall….or so I’ve heard. Alright, enough with the nonsense and tomfoolery. Let’s get down to why you are really here. The BC Ferry White Spot Nat’s Original Beef Dip Sandwich. As a side option I went with yam fries because I am crazy and oh so unpredictable. Eric Veal is awesome! See told ya, unpredictable. Let’s start with the yam fries. Alongside the sandwich there was a healthy helping of dark orange, skin-on frites. They were soft with a light batter creating a slight crunchiness. The fries were of the thin yet wide variety and upon first consumption it was apparent they were from a quality yam. A round, single serve plastic container filled with Triple O’s chipotle mayo accompanied the French fried yams (I apologize to anyone from Belgium, I am aware of the history of the “French” fry). The dipping sauce was more chipotle than mayo and all the better for it. Although slightly cold, I don’t have much complaint about the fries. They had the gentle luscious flavor of a sweet potato pie and were a decent side dish. The beef dip was more difficult to wrap my head around. Upon first glance it looked to have potential. The bread appeared to be freshly baked, within the last several days at least. There was plenty of sliced beef piled up inside of the roll. A small bowl of savory brown liquid sat idle on the plate just daring the sandwich to dip. 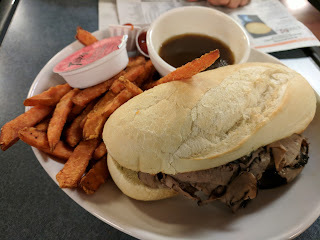 This au jus had plenty of flavor and tasted of real beef, not of a powder mix. It was uncommonly thick, almost a gravy. This allowed it to readily adhere to the sandwich, ensuring plenty of lubrication with every bite. It also gave the appearance of putting lipstick on a pig. This au jus was the star of the show. Although the show was a flop on Broadway. Now I’m getting ahead of myself..
Let’s take a bit of time on the actual sandwich now. The bread to meat ratio was very adequate. I wanted to make sure that there was something nice in this review, so there it was. The bread that served as the meat house was overtly bland. It tasted like what the flavour of a cumulus cloud would be. Upon the inside of the bread there was some variation of a garlic spread infused with some herbs and spices. As far as I could tell this served two purposes. It gave off the impression that the fabricators of the sandwich were putting forth some effort and it was the only real flavor of the sandwich itself. The beef of the dip was a bitter disappointment. 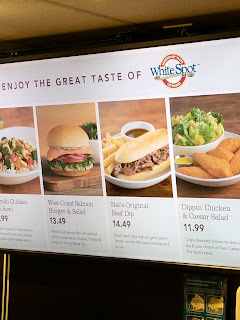 On the bright digital billboard which served as the menu, Nat’s Original Beef Dip is pictured with what appears to be moist, thin sliced beef cooked somewhere between medium and medium rare. The beef on the actual sandwich was sliced thinly, but it certainly was not moist. In one of the attached pictures it looks moist, however that is some of the butter from the bun creating a sheen. Dry, lean and bland. 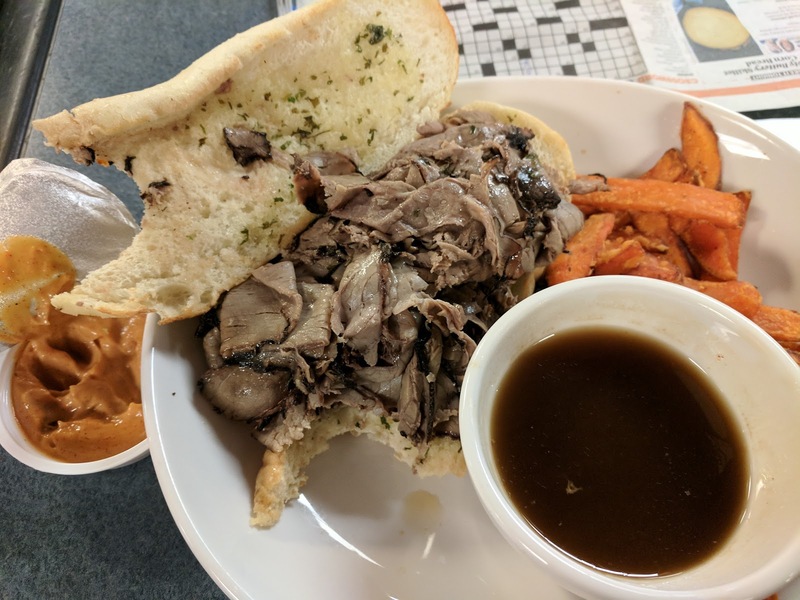 With the au jus and the garlic spread there was some semblance of flavor, the beef contributed very little to the flavor profile however. Going into this meal I had my doubts about the quality of the boat dip. It lived up to those expectations. Overall it would probably be best to choose something else from the menu on a BC Ferry trip. The cheeseburger and chicken burger are respectable, but this isn’t called Cheeseburger or Chicken Burger Review is it? Even being a captive audience on a ship at sea, don’t make the same mistake as me. Order something else to eat, for this sandwich has dry bland meat.